A foursome is a common golf group size. 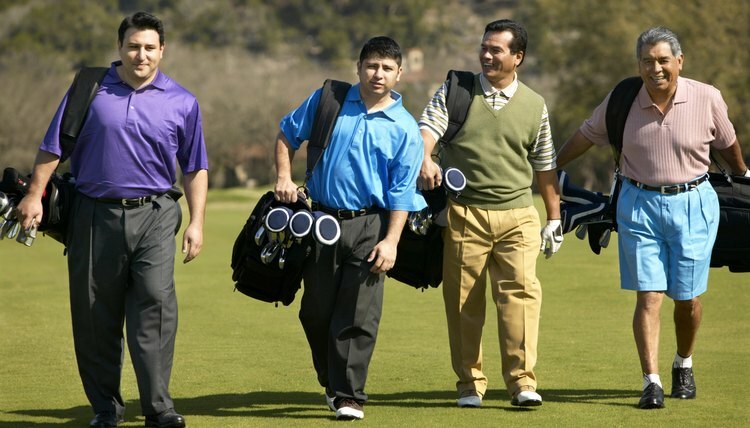 The typical single group of golfing friends will contain two, three or four people. These groups are referred to as twosomes, threesomes or foursomes, respectively. At many courses, a solo player or even a twosome may be combined with another group. Groups of more than four people are more unwieldy and are likely slow down play for following groups. Indeed, many courses discourage or even prohibit groups of more than four golfers. Larger groups, however, may get together to play at the same course by dividing themselves into threesomes or foursomes and playing separately. Groups of two to four golfers may simply play for fun, as a social activity, or for competition. The varieties of competitions available to golf groups is practically endless. Traditionalists may compete in classic stroke or match play, either with or without handicaps. A foursome may split into two teams for a best-ball match. Groups of two or more may also use a Stableford format, in which points are awarded for certain results, such as one point for a bogey, two for a par, etc. For gamblers, a skins game is another common option for two or more players. The lowest score wins the hole, as in match play. In skins, however, players typically place bets on each hole. If no single player wins the hole, the pot rolls over to the next hole, and so on, until someone wins a hole and collects the entire pot. Large groups -- multiple foursomes, for example -- may book tee times together to gain a discount from a golf club or a resort. For example, Jack O’Lantern Resort in New Hampshire offers packages -- including golf, meals and lodging -- for groups of 16 or more. Myrtle Beach, South Carolina, courses will accommodate groups ranging from four players to 100. Your local course likely offers discounts for large groups from offices, schools, churches or other organizations. Groups of various sizes may form a social organization that revolves around golf. The group -- or a portion of the group -- plays at a variety of local courses, dividing into threesomes or foursomes. For example, the Michigan Golf Club, in southeastern Michigan, has 135 members as of 2012. The New York Golf Meetup Group boasts 754 members while the BC Golf Pages Meetup Group in British Columbia has 1,281 golfers. Other social groups may include singles, players over or under a certain age, or golfers of the same gender. PGA Tour events typically feature threesomes for the first two rounds of stroke play tournaments, then switch to twosomes for rounds three and four, after the field has been cut. At the 2012 Byron Nelson Championship, for example, 52 threesomes teed off during the first two rounds. A pro-am event typically begins with foursomes, as one tour pro plays with three amateurs.